Ginkgo have a bad reputation for developing ramification, but that doesn’t mean they don’t ramify at all – they just need some encouragement! 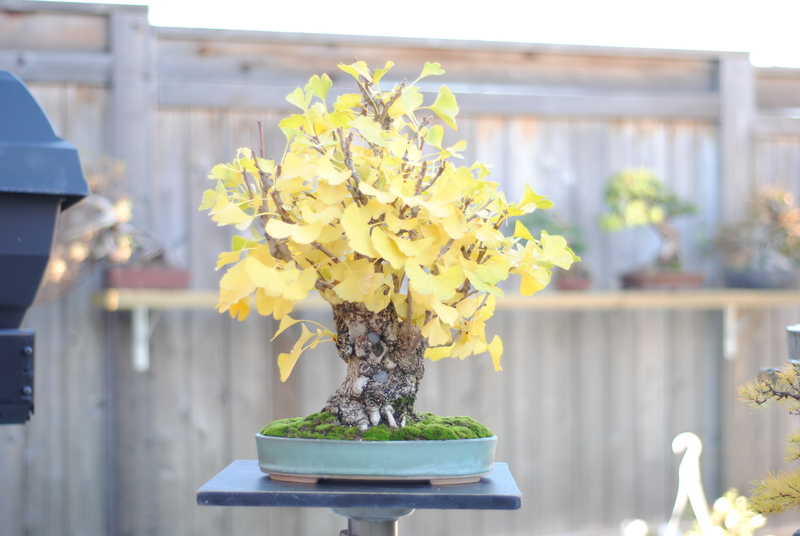 Unlike other deciduous species like Maple or Elm that will develop some ramification even with improper cutting techniques, Ginkgo will barely ramify at if they are not cut properly. Still, even in the best of cases, Ginkgo ramification cannot hold a candle to that of maples… but that is just the character of the tree. They are still a great species to work on. 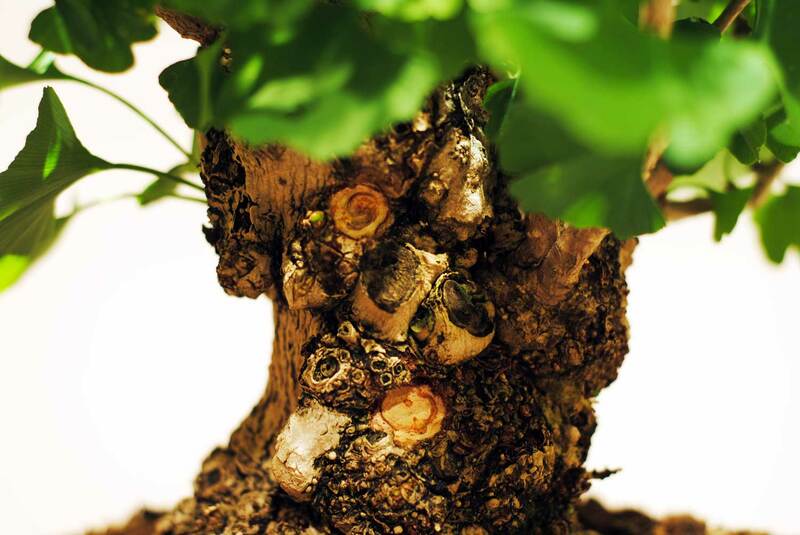 This post outlines the pruning techniques I use on my Ginkgo in USDA zone 6. The first step is making sure the tree is growing strong. This tree was repotted in March but has grown better than expected. I don’t cut my ginkgo until it is showing very strong shoots like this (about five pairs of leaves). This gives the tree some time to build up strength. I find that if I cut it too early, the tree doesn’t respond well. Here is a typical gingko branch. The buds circled in red are backbuds. Ginkgo backbuds very well, and most buds open up in the spring. However, the problem with Ginkgo is that it is hard to get these backbuds to extend into twigs. Usually only the end of the branch (circled in blue) will extend during the growing season and the backbuds will just form winter buds. 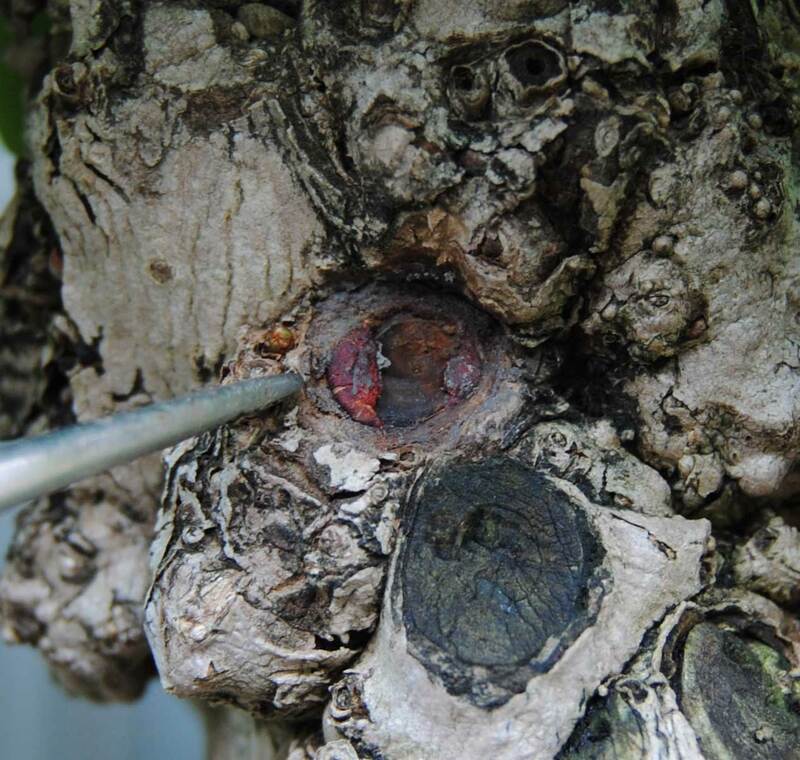 Therefore, you need to cut back the tip of the branch to one pair of leaves to redirect some strength to the backbuds. This is a rather weak branch, so the side buds may not even start to extend until the process is repeated next year. Again, I find that if the tree is allowed to gain some strength in the spring, you will have much better luck getting the backbuds to extend. Here is a stronger branch after cutting the tips back. This branch is strong enough that I would expect some of the back buds to extend. Strong apical nodes that have not yet extended may have 3-5 leaves instead of the usual 2. Cut off some leaves to leave just a pair. This weakens the outside of the tree and allows more light into the inside. This is especially important for the top of the tree since Ginkgo are very apically dominant. After cutting. 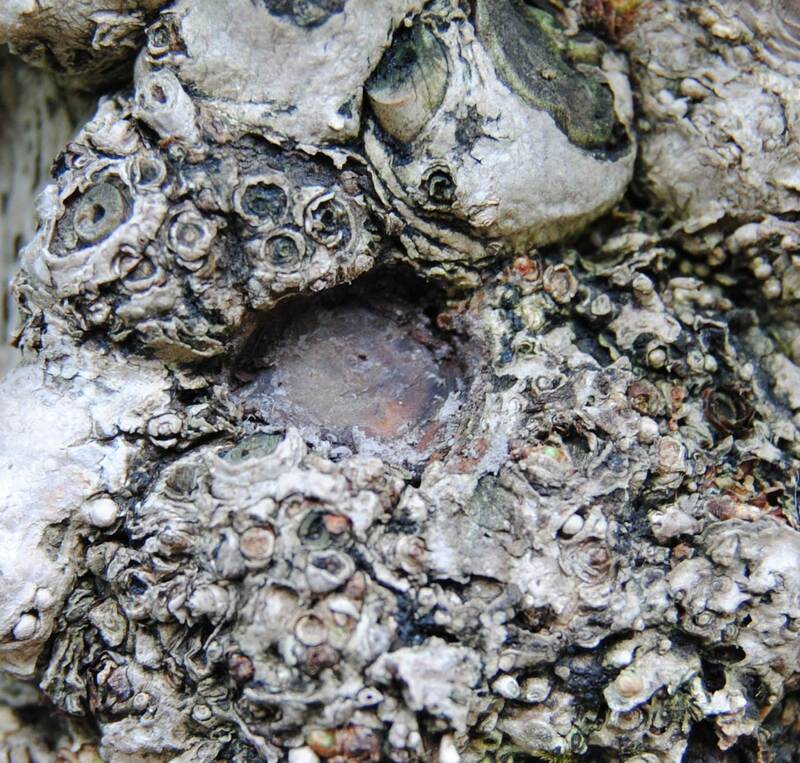 I will continue to fertilize the tree heavily and the process may be repeated again in the summer. Further leaf-thinning may occur throughout the season. 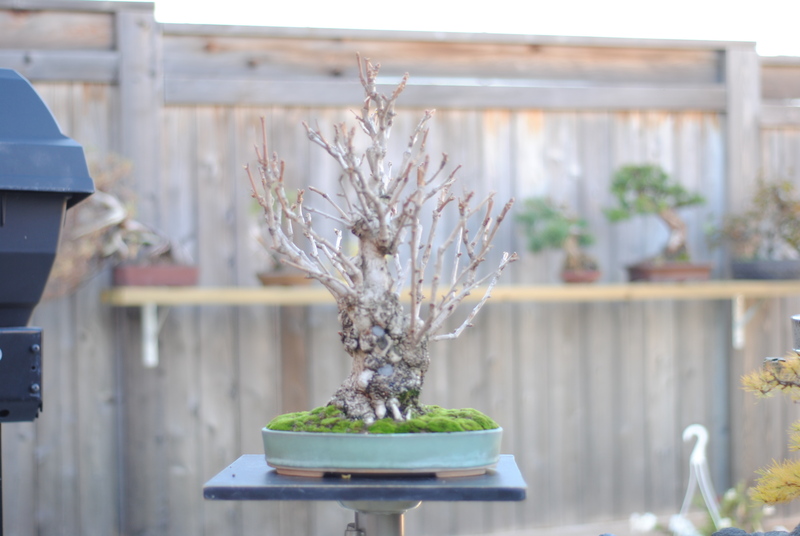 Really, the pruning techniques for Ginkgo are very similar for most deciduous trees. The development is just much slower and the end result less ramified. However, I’ve found that by using the above strategy, I can increase the twigginess of the tree by about 50-75% each season. We are finally getting consistently warm temperatures, so my trees are really starting to move. Looking at them gives me a reminder that I have a lot of work to do 🙂 Sorry for the busy background… bad camera settings. Ginkgo. If only the leaves would stay this size! This is the first spring where I am having trouble keeping up with the needed work on my trees. I am planning on doing some (more) culling on my collection soon, but much of that depends on the survival rate of my newly collected yamadori. I don’t have a huge collection (40-50 trees), but giving every tree the attention they need really takes a lot of time. In the meantime, I am busy as hell. A friend was nice enough to remove the wire from my Ginkgo for me 🙂 As a side note, this guy also has an amazing collection of fine mame and shohin sized pots and is always selling/buying. If you are looking for nice small pots, check out his website: Mame & Shohin Bonsai Pots. As for the Ginkgo, many of the branches sprang back once the wire was removed. Kind of expected. Ginkgo is tough to wire because it scars so easily. Last year I wired it in late October and took off the wire yesterday (April 30). The branches seemed to have set better than in the past where I have wired it in March and had to take the wire off by early June. I still haven't decided on a front for this tree. I think this side is more attractive, but the apex leans slightly back (it was not designed as the intended front by previous owners). I think this is the original front of the tree, but I don't like the two symmetrical lumps about 1/3rd up the tree. They never used to bother me, but then my friend's wife pointed out that they look like bull testicles. Now that's all I see!